After a young man named Eutychus falls from a window and dies while Paul is preaching, Paul raises him back to life. ROM MACEDONIA, PAUL sailed across the sea to Troas, the city where he had seen a vision of a man of Macedonia calling for help. In this city he stayed for some days, then he made ready to start again toward Jerusalem. On the night before leaving Troas, Paul preached a farewell sermon to the believers who lived in that city. They met together in a large room on the third floor, and here they broke bread in memory of the special supper that Jesus ate with his disciples before he was crucified. Then Paul talked to them until midnight; for he knew he should never see them again and he had many things to say before he should go away forever. While Paul was talking, a young man named Eutychus sat in an open window listening. After some time he grew sleepy and began to nod. Then he fell into a deep sleep and sank down on the window-sill. Losing his balance soon afterwards, he dropped from the window to the ground below. Friends rushed down the stairs and found that the fall had killed him. Then Paul went down to them and saw them weeping. He fell on the lifeless body, embraced it, and said to those who stood near, "Do not be troubled, for his life is yet in him." After this had happened Paul returned to the company of believers upstairs and took food with them. He then continued his talk until break of day, when he bade them farewell and departed. 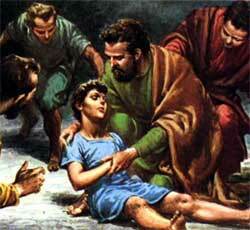 They brought again into the assembly the young man who had fallen from the window. And the believers rejoiced to see him alive. Paul's next farewell-meeting was with the men who had come from Ephesus to the seacoast to meet him. These men were the one who had taken the leadership in the church at Ephesus when Paul left them. They were men whom he loved, and whom he counted faithful. They were called the "elders" of the church. Paul talked earnestly to these Ephesian brethren, reminding them of his work among them, and of his desire to teach them the whole word of God. He told them that now he was journeying toward Jerusalem and that they should never see his face again. He said he did not know what would befall him in that city, only the Holy Spirit was warning him of danger ahead. But he said, "None of these things make me afraid; for I do not count my life dear to myself. I am determined to finish with joy the work I have received of the Lord Jesus, to tell the gospel story to all men." Paul reminded them also of his work among them, how he had coveted no man's riches but had worked with his own hands to earn money for his food and clothes while he preached the gospel in their city. And he urged them to remember the words Jesus had spoken, that it is more blessed to give than to receive. When Paul had finished speaking he knelt down with the men and prayed earnestly to God, then he bade them good-by. These men wept aloud, and embraced their beloved teacher who would never more return to them. Then they went with him to the ship, on which he and his companions sailed away toward the homeland of the Jews. At the seacoast town of Tyre the ship stopped several days, and here Paul and his companions met some more Christians and worshiped with them. When the time came for the ship to leave port, the Christians went with Paul to the seaside, and they knelt down on the shore to pray. Even the children of these Christian fathers and mothers went with Paul and his friends to the ship. The Holy Spirit had caused these Christians to understand that troubles would befall Paul in Jerusalem, and they urged him not to continue his journey; but he believed it would please God for him to go on. While Paul and his fellow travelers were visiting the church in Caesarea, an old man named Agabus came from Jerusalem. This old man was a prophet, for God caused him to know things that were to happen after a while. When he saw Paul he took off Paul's girdle and tied it about his own hands and feet. Then he said, So shall the wicked Jews at Jerusalem do to the man who owns this girdle, binding him and giving him over to the Gentiles. Paul's friends were greatly troubled when they heard this. They gathered round him, weeping, and pleaded with him to stay away from Jerusalem. But he answered, "Why do you weep and break my heart? I am ready, not only to be bound at Jerusalem, but also to die there for the name of the Lord Jesus." When they saw they could not prevent him from going, they said, "The will of God be done." Not many days afterwards Paul and his companions went over the mountains to the great city of the Jews. Other Christians from Caesarea joined their company, and when they came to Jerusalem the elders in the church there welcomed them with joy.